On May 24, 1861, Union troops crossed the Potomac River into Virgina and occupied the Arlington Estate. Officers lived in the house while hundreds of soldiers camped on the grounds. The Army crisscrossed the estate with roads and telegraph lines, and cut most of the 200 acres of virgin oak forest behind the house for fortifications and fire wood. This Civil War photograph was taken from approximately where you are standing. Erected by National Park Service. Location. Marker has been reported missing. 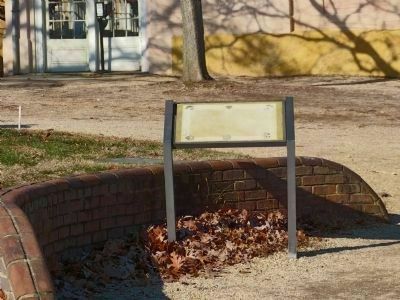 It was located near 38° 52.847′ N, 77° 4.352′ W. Marker was in Arlington National Cemetery, Virginia, in Arlington County. Marker could be reached from Lee Drive. Touch for map. 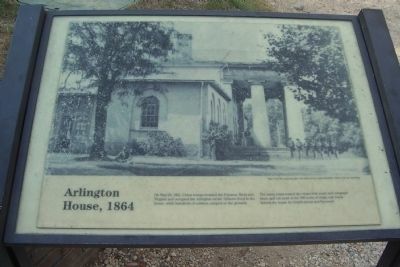 "Arlington House" (a.k.a. 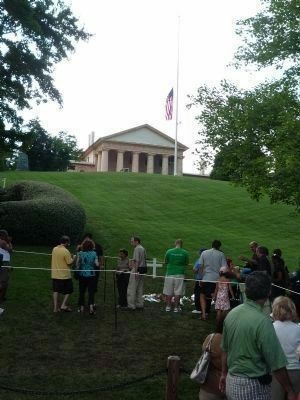 the Custis-Lee Mansion and/or the Robert E. Lee Memorial) is within the National Cemetery, on a hilltop accessible by pedestrian and tour buses, about 0.15 mile northeast of the intersection of Sheridan and Sherman Drives. Marker was in this post office area: Fort Myer VA 22211, United States of America. Touch for directions. (within shouting distance of this marker); Pierre Charles L’Enfant (within shouting distance of this marker); Guardian of a Nation's Heritage (within shouting distance of this marker); Arlington Estate, 1860 (within shouting distance of this marker); Civil War Unknowns Monument (within shouting distance of this marker); The Arlington Woodlands (within shouting distance of this marker); American Volunteer Group, China Air Task Force and the 14th Air Force (about 300 feet away, measured in a direct line). Touch for a list and map of all markers in Arlington National Cemetery. Additional keywords. 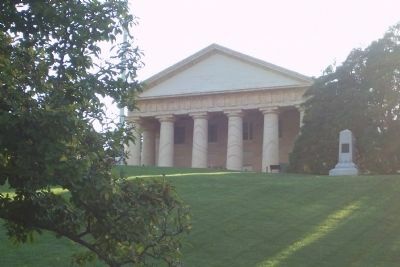 Custis-Lee Mansion; Horatio G. Wright; Arlington National Cemetery. Note the prominent monument to Brevet Maj. Gen. Horatio G. Wright at the crest of the hill, in front of the trees to the right. During the Civil War, General Wright was a key leader within the Army of the Potomac, ending the war as a Corps commander. General Wright served as Army Chief of Engineers after his Civil War service, overseeing the completion of the Washington Monument. Accordingly, he was buried at Arlington House with its view of that monument (then the tallest structure in the world) in mind. 5. 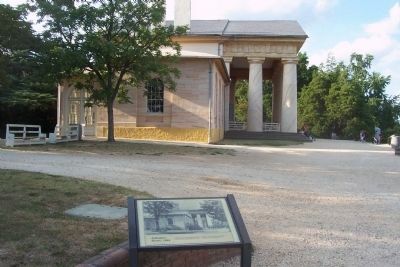 Arlington House, viewed from near Senator Edward Kennedy's gravesite. 6. 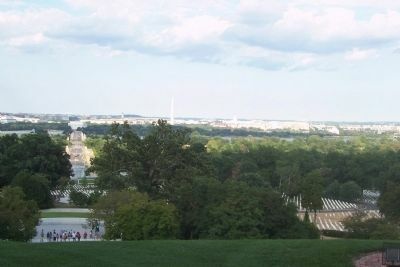 View from Arlington House toward the Washington Monument, President Kennedy's gravesite, lower left. More. Search the internet for Arlington House, 1864. Credits. This page was last revised on June 16, 2016. This page originally submitted on September 1, 2008, by Richard E. Miller of Oxon Hill, Maryland. This page has been viewed 1,442 times since then and 12 times this year. Last updated on December 12, 2013, by Allen C. Browne of Silver Spring, Maryland. Photos: 1, 2. submitted on September 1, 2008, by Richard E. Miller of Oxon Hill, Maryland. 3. submitted on December 12, 2013, by Allen C. Browne of Silver Spring, Maryland. 4. submitted on September 1, 2008, by Richard E. Miller of Oxon Hill, Maryland. 5. submitted on September 1, 2009, by Richard E. Miller of Oxon Hill, Maryland. 6. submitted on September 1, 2008, by Richard E. Miller of Oxon Hill, Maryland. • Bernard Fisher was the editor who published this page.